When the beautiful Woman confessed she had a son, 10% knew he would be executed 10% from Palermo Sicily to New York, page 20. 10% left behind some poems expressing all the love he felt for his Woman. This is a love story that never ends when life itself hasended .10% appears to the Beautiful WomanLike the sun appears through the cloud, smiling, warming her throughout. Fading in and out Through the… clouds, like love. 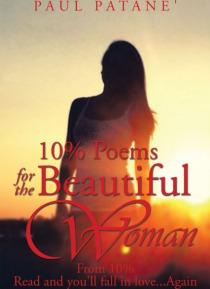 10%s love for the Beautiful Woman shines through his poems.